If you plan to use the ever-popular United States Postal Service to ship your eBay merchandise, printing your postage and labels through PayPal gives you a free delivery confirmation with Priority Mail. A delivery confirmation is available also for Media Mail, Parcel Post, and First Class mail for a minimal charge. Service type: Choose the level of mailing service you want for your package from this drop-down list. Priority Mail is usually the standard. Package/thick envelope: Your package or envelope qualifies for this status if the length and girth (all the way around) is no more than 84 inches. Large package: Your package is larger than the preceding category, but doesn’t exceed 108 inches in combined length and girth. Weight: Here you enter the weight of your package. Tracking Number: Confirmation and Tracking is free with Priority Mail. Signature confirmation: Signature confirmation provides you a signature and date of delivery and is available for many levels of service. If you’d like a signature confirmation for your package, it will add $2.20 to the postage cost. You can track the progress of your package as it travels through the USPS online. Don’t forget that if you ship an item with a value over $250, PayPal requires signature confirmation for the item to be covered under the PayPal Seller Protection program. 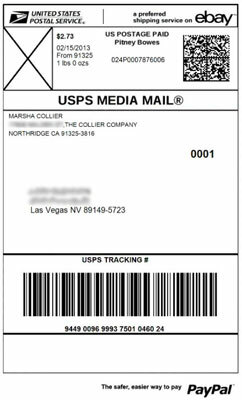 Display postage value on label: If you’d prefer not to show the amount of the postage on the label, do not check this box. That way, whatever handling fees you charge your customer are transparent. On the other side of the coin, if you’re trying to be a good seller (so you can receive great DSR ratings), you might not want to hide how much you actually pay for shipping. That way, the customer can see that you haven’t padded the shipping fees to pad your wallet. Add message to buyer e-mail: Customer service to the fore! Put a check mark in the box and type a short note to let your customers know you appreciate their business. Item(s) purchased by: In this area you see the name of the item you’re shipping and the buyer’s eBay ID. If everything looks okay, click Purchase Postage. Unless you’ve agreed to automatic payment, you’ll have to sign in to your PayPal account once again. Select your method of payment by clicking the arrow next to payment methods. If you’ve withdrawn your PayPal balance to your bank, prior to printing your labels, you may select a credit card or bank account with which to pay for the postage. 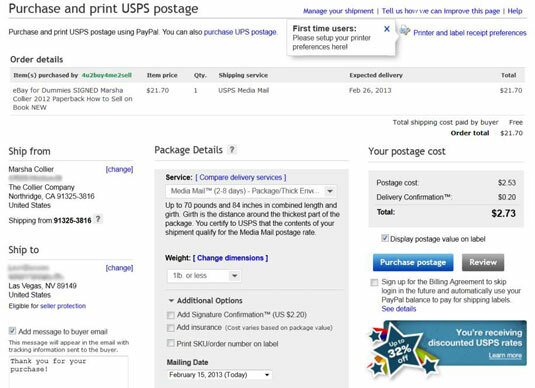 Your preferred payment method is charged for the postage amount, and a new window opens to allow you to print postage on your printer. Print the label by clicking Print Label. You can now request a pickup from the post office by clicking the Request Pickup link, which takes you directly to the USPS site.